A huge congratulations goes out to Susan Engle as she placed 1st with her horse Mya and 3rd with her horse Ripley in the October online International Horse Agility Competition. 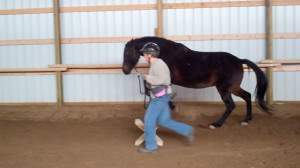 This was Susan’s first time to compete in the Horse Agility course, there were 18 horses in her class. Susan had a perfect score of 100 in fact she was the only one with a score of 100 for the entire competition of all the different classes. 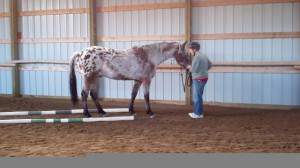 “After the 3 weeks into my second agility online class with Kim I enter the October 2011 International Online Horse Agility competition in the ‘Starter Level Course’. I thought that this would be a good experience to find out what it was all about never figuring I would place in the top 10. There were 18 entries in my class and I entered both my gelding Ripley and my mare Mya. What a surprise when Mya won 1st place with a score of 100 (perfect score) and Ripley took 3rd place with a 98. In fact Mya was the only horse with a perfect score of 100 for the entire October competition for all the different classes. 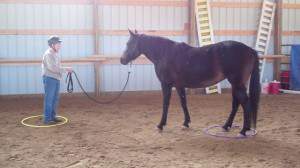 This may look like a simple obstacle course but it is much more than that as it is about your Horsemanship skills and the partnership you have with your horse. 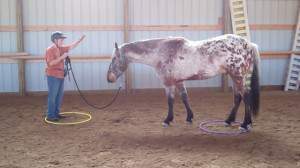 In order to accomplish the high score that Susan did she had to go through the course and not pull on her horse (keeping slack in the lead during the entire course) as her partners looked to her the entire time and they worked together as a team. Way to go Susan as I am so proud of you, Mya and Ripley!